We are excited to share with you an opportunity being offered by Maxine Schuetze, a 4-H volunteer leader with the Pine River Peppers 4-H Club. Maxine is continuing to offer opportunities for all clothing project members in Lincoln County to develop their skills as they work on various clothing projects. On the second Monday of each month (unless noted) from 6-8 p.m. Maxine is offering the opportunity for Clothing Project members to work on various clothing projects. The meetings are held at the Lincoln County Service Center in Lower Level Conference Room 156 at 801 N. Sales Street in Merrill. Concentration needed to get project off to a great start…. 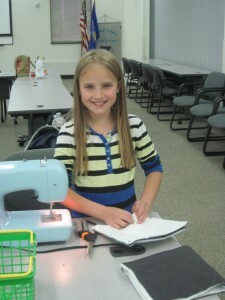 If you have a sewing machine, you are asked to bring your machine with you to use. We have a couple of sewing machines you can use if you do not have your own. Since a lot of clothing is personal choice in fabric patterns and colors Maxine has given participants the option of purchasing their own materials or having her purchase the materials and they reimburse her at a cost of between $5 and $10. If you want Maxine to purchase your materials, please let Maxine know so she can be prepared. If you have any questions contact Maxine at mafehrmann@yahoo.com or (715)212-2838. On Sunday, January 25, 2015, some clothing project members went on a field trip to explore two stores in Rib Mountain. 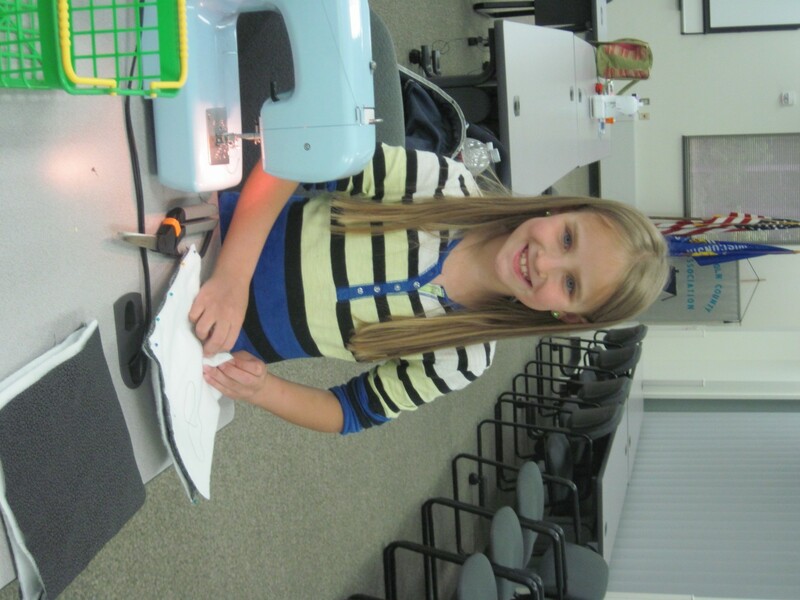 First, we went to SewSmart which specializes in sewing machines, quilting, and machine embroidery supplies as well as offering classes. This was a very hands-on experience of both practicing free-arm embroidery and making a star out of gems to iron onto something when we got home. It was fun watching a sewing machine punch out the template for the gems and learned that it could also paint. Our heads were filled with ideas for quilting and using a serger machine for recycling clothing. We also headed over to JoAnn Fabrics and Crafts to learn more about different types of fabrics, from leightweights to bottomweight and everything in between, and where to find a few of the notions that may be needed for a clothing project. 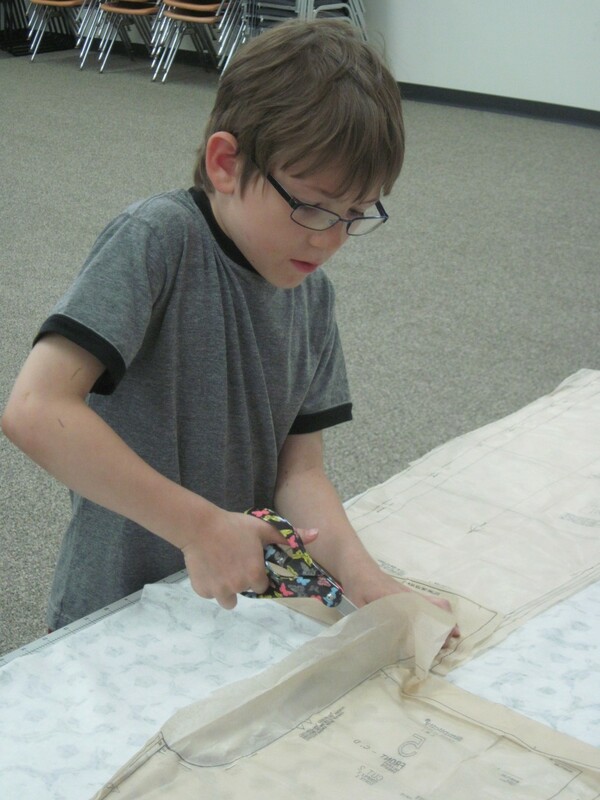 Our day concluded with a scavenger hunt of not only fabrics and notions, but also how to care for the items purchased and prices to use as a comparison. Thank you to both stores for taking the time to assist in this learning experience! 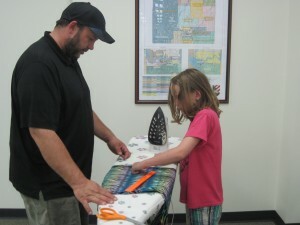 You will find additional information about the 4-H Clothing projects on the project pages of the Wisconsin 4-H website under Family, Home and Health. Information found here includes a listing of 4-H literature for each project, statewide events and additional resources.